I love fast food... or at least what for me still is and remains fast food, though Slow Food and friends insist on you calling it "street food" nowadays. More politically correct maybe, or justa differentiation to isolate the bad guys under the "fast food" label I guess. Call it whatever you like, what I'm talking is not McDo's cardboard burgers, rather all the typical food served "to go" all over the world: tasty, even delicious at times, unique and usually a calorie bomb. Traveling through a few Italian cities, I was inevitably greeted by the familiar sight of major US Burger chains, Starbucks-like joints, presumedly Neapolitan pizza stalls -selling in truth tomato and cheese topped industrial grade cardboard- and the ubiquitous Chinese takeaways and Kebab shops. All edible, minus the cardboard, yet boring. Why eat a sweet sour pork or a compressed chicken meat breaded lump (with additives) when you're somewhere new? Go look for the local stuff, follow your nose or ask a passer-by for a tip if you need to, and discover new food, that's what I always tell myself. Sometimes I will go against my tip and better judgment, I have to admit, but that's just because I can be really lazy if I wish to. After the salumi and dinner of the day before, I was walking around Parma, looking at the sights, doing a little (cook-)book and food shopping and just killing time before dinner. Although I had decided to skip lunch for once walking three times out of the same bakery and seeing the numbers of people coming out with the local fast food speciality proved too hard to resist. I went in and came out a few minutes later holding my own piece of Erbazzone, a savory pie filled with a rich and extremely tasty spinach and swiss chard greens mixture. Though original of Reggio Emilia, Erbazzone seemed to be on sale everywhere in nearby Parma, in its classical version or even with a few alternative fillings. Don't get fooled by the vegetable filling into thinking of this as a light snack: it probably has enough calories to fuel a family of four for a day. Alongside the greens there's plenty of Parmigiano (inevitable in these area), pancetta, spring onions, garlic, parsley, and some recipes add an egg or even ricotta. Plus do you see those tiny brown bits on top of the crust? Crunchy pancetta bits: isn't that lovely? Beats a Big Mac every day. P.S. for those interested in a recipe there's a good one from Mario Batali here. Apart Mario getting the city of origin of Erbazzone wrong, his recipe is quite heavy on the eggs . He's not the only one around doing so, though modern recipes are somewhat lighter and often use only one egg. Sfinciuni and the missing recipe information. ...he is not a good cook if he cheats himself to this puny and sadistic trickery of his admirers, and no deep-fat kettle is too hot to brown him in. Which is in this case extremely fitting, since the recipe comes form Palermo's Antica Focacceria S. Francesco famous, among other things, for its fried goods. I'm not what I would call a "recipe fine-tuner". When I usually test a recipe I either am disappointed, and just avoid making the same recipe again, or I like it and put it in my mental "to be cooked again" folder (although the "cooking again" seldom happens, too many recipes to try out there). But sometimes I'm ready to make an exception. Naan is probably my favourite flatbread but I can't go to my favourite Indian every time I feel like it. So I started looking for a good recipe for home oven baked naan. Ok, making naan in a home oven is not the ideal option,but how many westerners have a tandoor? As much as I would like to get involved in some time-consuming baking project, I just can't at the moment. Still I've been becoming more of a "baking-junkie" lately :-), so I just have to bake at least once a week. Handling the dough, shaping and finally seeing those breads come out from the oven has a soul-warming effect for me. It can also be terribly frustrating, if it doesn't turn out as it should. Giving my time constrains at the moment, having something that can be kneaded, shaped and baked in a few hours time is great. I was also feeling like playing a bit so I decided to make some flavoured fougasse. Fougasse is the Provencal brother/sister of the Genovese focaccia. It is often sweet, with anise seeds and orange zest as flavouring, but can also be savoury: herbs and olives versions are quite common. What I really like about fougasse is the shape, like a slashed leaf or a ladder, depending on the slash pattern. I decided to do 4 small breads each with a different flavour. Here is what I made (from left to right in the picture above): fougasse aux fromage, cheese, fougasse aux lardons, bacon, fougasse aux olives, er... olives :-) and fougasse aux Roquefort, with the famous blue cheese. There is one bread book I can never get tired of. I's also a book that any serious flatbred lover must have: Jeffrey Alford and Naomi Duguid's Flatbreads and flavors. Apart from having a wide range of flatbread recipes (which sometimes have a minor flaw, see below), there's loads of matching recipes to go with them (salads, sauces, stews, etc.) and always some nice background story going with them too. It's a book I've read already twice from beginning to end and I have a feeling it won't end at that. Saturday my hands were itching from the need to bake something, but I didn't have so much time so after looking at the list of quick breads in the book I decided to go for emeruli khachapuri or Georgian cheese-filled bread. 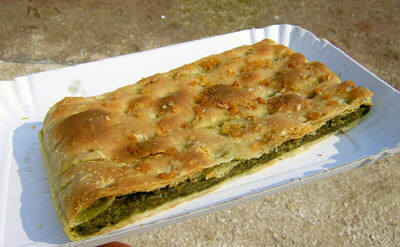 Flatbread, yep; quick, just what I needed; filled with delicious melted cheese... what could I ask for more? If it's good it ain't healthy! Every food-loving person I know has a "dark" passion they would rather not talk about. It's either something other people find disgusting (a friend loves marmalade and mustard sandwiches), totally unhealthy or something other food lovers would strongly disapprove of. One of my "dark passions" is fried bread dough, possibly on the oily side. I recently discovered, at our local Christmas market, a stand selling Hungarian langosh, potato enriched dough disks fired and topped with garlic, sour-cream and eventually cheese.... mmhhh de-licious! In Naples similar street food exists: little balls of fried dough are eaten as snacks from friggitoria stalls and are called paste cresciute (risen dough). Fried pizzas are also quite common. 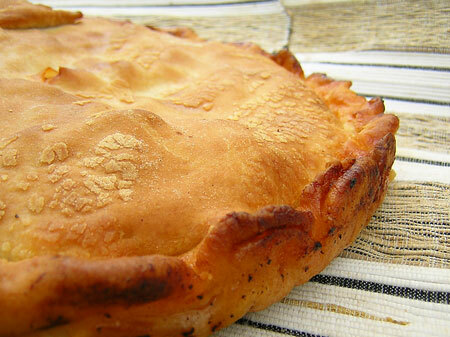 The original fried pizza is actually a calzone filled with ricotta, pepper and pork cracklings. It's slowly disappearing but it once was much easier to find than the baked pizzas. After all all one needs to make them is some fire, dough and a pot full of oil. Such a pizza plays a role on one of my favourite films about Naples, L'oro di Napoli. Tomato topped pizzas are also quite common and usually loved by children. In a bout of nostalgia I decided to make these pizzas at home. Yesterday I decide I had to bake some flatbreads again. I actually had planned to try quite a few recipes from Jeffrey Alford and Naomi Duguid's Flatbreads and flavors but sort of got more interested in trying other recipes. I decided to go for scallion pancakes, or as they call them, Sichuan pepper bread. Together with them I decided to eat stir fried greens, probably not a traditional match (but I was craving them), and a chilli-peanut dip which Alford and Duguid describe as "the perfect dip for any flatbread". With such an introduction one has to try the stuff, right?